Lonely Planet is the largest travel guide book and digital media publisher in the world. Lonely Planet gave us a big discount for purchasing our travel guides! Britz offers campervan, motorhome and car hire options for people to explore the great nature of New-Zealand, Australia, South Africa or USA. In New-Zealand we will travel in a Britz campervan and the company gave us a nice discount for it! Chapka Assurances is a specialist in travel insurance since 2002. Chapka counts more than 2 million people insured worldwide (including us!). They have given us a great discount for the 2016-2017 trip insurance! EMCO2 Solution was a carbon strategy consultancy, which assisted its clients in calculating, reducing and offsetting their carbon footprint with a choice of high quality emissions reduction projects. EMCO2 Solution gave us a discount when we made the Episode I trip carbon neutral. TV5 Monde is a global television network, broadcasting several channels of French language programming. In the middle of the Episode 2 crowdfunding, TV5 Monde selected our project and decided to support it! Vaude is a German producer of mountain sports equipment. Since 2010, the company is a member of the Fair Wear Foundation, an organisation which is seeking to improve working conditions in the textile industry. At the end of last year, Vaude has won the first place in the category Germany's Most Sustainable Brand of the prestigious German Sustainability Award. Fairphone designs and builds smartphones which are more respectful of workers and the environment. 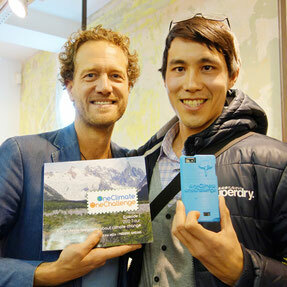 Our smartphone is a Fairphone. The Dutch startup gave us cool t-shirts!